I wonder if anyone has ever tried to articulate or translate social expectations into a measurable format. I’m talking about an equivalent to grams, kilos, pounds, etc. We always talk about the ‘weight of expectation’ – so why not start measuring it? While it would take some time for society to tune into what 1, 25 or 60 normods felt like, over time, we would soon be able to immediately understand the weight of social expectation on ourselves or others, just the way we can mostly work out a litre of water, 125g butter or a cup of sugar. It’s all about using the measurements in our daily discourse and normalising our understanding of what 1 normod feels like in the first place. 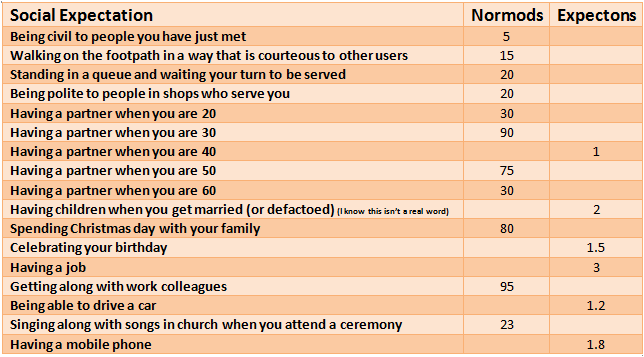 So to start the movement, I suggest the following table for measuring social pressure. Note: the examples are based on my culture, my life, my social context, my age etc etc and would certainly be open for opinion, challenge and a bit of a finger pointing and laughing at. With this new way of expressing how we feel about having to ‘do’ certain things, or ‘be’ a certain way because that’s what everyone expected of us, we could save time trying to express our feelings about fitting in by allocating a value that would mean something to everyone and let them know he we are feeling by way of a common currency. Therefore, when it came to people judging you for sleeping separately to your partner, you would be able to quantify the pressure you felt. Personally, I feel about 5 normods when it comes to the pressure I feel to sleep with my husband. There’s a hint of ‘we’re a bit different and what will people think of us’, but certainly not enough normods to bother me. So when you are feeling under pressure to conform, or thinking that you are going to get into trouble if you don’t act a particular way, feel free to quantify those feelings into normods and expectons. Now I’m off the National Measurement Institute in Sydney to fill in the form that will start this social revolution.